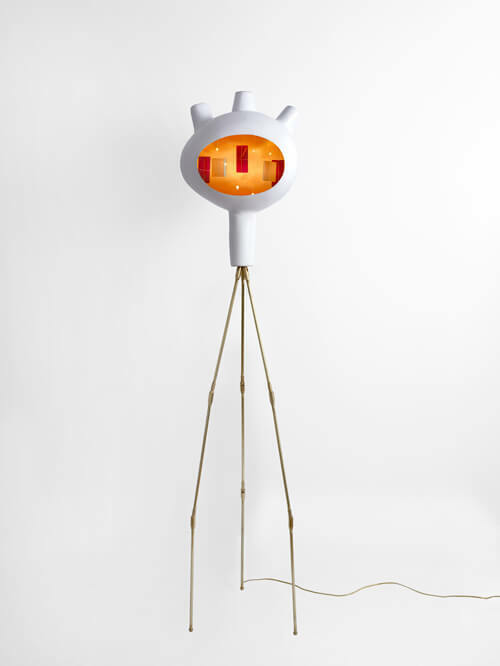 The Idea from Victor Vetterlein is to present a Tripod floor lamp ‘Woojuin-2007 FL-1. The floor lamp can emit a light similar to a fireplace light, the design resembling with futuristic digital automatized world. Word of the automation concept, the top of the lamp, “head lamp”, is especially large ​​to suggest a big brain, a large memory. Objects that can see inside the lamp and are suspended in it (beads, polished tiles, bronze and stained glass) is energy and consciousness. The lamp body is created with a finished design, lamp legs are specially designed to give handling, as is a floor lamp, setting the feet on the floor. The body of the lamp is productive and efficient.